Cobblers players held a ‘meeting’ in the aftermath of last week’s crushing home defeat to Colchester United in an attempt to quickly put things right ahead of back-to-back away games against Tranmere Rovers and Lincoln City. 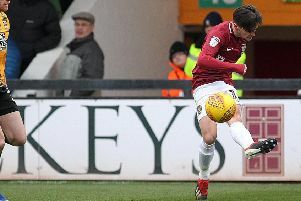 A second-half collapse saw Northampton blown away by three goals in a 15-minute spell against Colchester en route to their heaviest home defeat of the season, eventually beaten 4-0. As a team we had a meeting to make sure it doesn’t happen again and make sure we were fully ready for the two games this week. Looking to right the wrongs of that defeat and ease their relegation fears, the players got together to to pinpoint what went wrong and ensure it doesn’t happen again. And whatever was said certainly did the trick as Cobblers won 2-1 at Tranmere on Tuesday and then returned home from table-topping Lincoln with another important point on Saturday, steering them 10 clear of the drop. “It’s been a great response from the lads this week after last Saturday and that’s what we wanted,” said captain Aaron Pierre. “As a team we had a meeting to make sure it doesn’t happen again and make sure we were fully ready for the two games this week. “Fortunately, we won Tuesday’s game and then we had to get ready again for Saturday because they’re a good team and they’re very effective in what they do. “It’s obviously never good to lose on your own ground, especially 4-0, so we were all disappointed and frustrated but we had the same amount of chances as them. They took their chances and we didn’t take ours; goals change games and goals change emotions. Jordan Turnbull did not play in the defeat to Colchester but he was equally keen to make amends with a positive reaction at Prenton Park and Sincil Bank. He said: “I think throughout the season it’s happened to us quite a lot – we’ve had the odd really bad game and we look back on it with disappointment but then we manage to pick ourselves up. “Hopefully now we can keep going on and push on from this because we want to continue picking up points until the end of the season - we don’t want another one of those blips again.